*	The game map represents your progress. *	Your disposable cash is displayed here (A). *	Open and completed towns (B) can be selected. *	Locked towns (C) have this purple tint and cannot be selected. *	Select this (D) to open Grave Maniacâ€™s list of chase sequences. *	Open the Achievement list (E) to view the postcards you collected. *	You can drag the map to view other areas in the screen, or you can drag the node like a scroll bar (F). *	Select PLAY (G) to open the last opened town. *	Select BACK (H) to return to the Main Menu. *	(A) Completed levels have covered caskets. They change color depending on your score. *	They can be replayed anytime. *	(B) Last unlocked levels have open caskets. *	(D) Urns are Johnny's special Graveyard levels. They differ greatly from Bonnieâ€™s Workshop levels. *	Select PLAY (E) to play the last unlocked level. *	Select BACK (F) to return to the Map screen. *	Select SKIP (A) to end the cutscene. *	Select NEXT (B) to proceed to the next line of dialog. 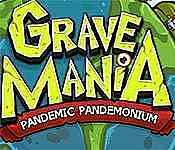 Sign-up to get informed when the Grave Mania series has new game released with BD Studio Games' FREE bi-weekly newsletter.